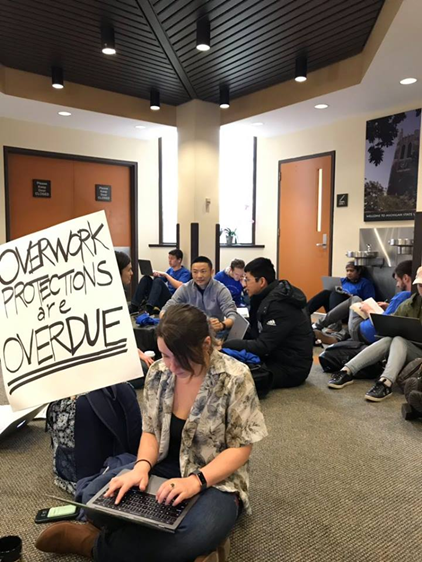 On April 4, MSU graduate assistants filled the lobby outside bargaining to grade papers in protest of the university’s rejection of several key contract proposals. The rejected proposals in particular affect international graduate students, a group that faces a number of hurdles and disadvantages within the university like extra fees to attend MSU, unclear standards and regulations of English speaking evaluations to qualify for teaching positions, and strict working guidelines for their visas that may be violated by overworking. GEU is proposing to abolish these fees, make language assessment more transparent, and provide protection against overwork for international students. 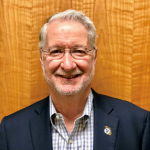 Eric Rader, External Vice President of the Henry Ford College Federation of Teachers, was elected the Executive Committee of the Michigan Democratic Party. I appreciated being re-elected. Rader is a longtime Democratic Party activist who truly earned this position. Congratulations Eric. 2019 Rollie Hopgood Future Teachers Scholarship Award Applications Now Available Online! AFT Michigan has three eligibility categories of the “Rollie Hopgood Future Teachers Scholarship Award” for individuals whose future goal is to become a teacher. 3. AFT Michigan dues paying member’s son(s) and/or daughter(s) who is a graduating senior with the goal of becoming a teacher. Click here to download the applications. If you have any questions or concerns, please contact Linda Moore at tftlindamoore@gmail.com. This in-service will establish the connection between culture and learning, and explore research-based strategies, such as cultural competency, high expectations and critical consciousness. Community schools: What are they, and how can these schools improve student competencies, pedagogic outcomes and school climate? By participating in this webinar, you will learn from educators at the United Federation of Teachers and the Baltimore Teachers Union about how community schools—which enable powerful learning through expanded opportunity and deep networks of partnerships—can also create hands-on learning experiences to ensure student success in the classroom while reducing demands on school staff. Register now. Have education research data ever seemed to be inapplicable or even incomprehensible? This webinar provides participants with a straightforward assessment of the complex international comparisons we often run into, making them more digestible by connecting them to real-life stories from educators worldwide. Join us to learn the difference between fact and fiction as we conduct a deep dive into U.S. education and the international comparisons that drive our policy decisions. Register now. To update your email address, change your name or address, or to stop receiving emails from AFT Michigan, please click here.